Powers/Abilities: As Red Guardian, Belinsky was agile and trained in combat, though she possessed no known superhuman powers. Red Guardian's belt buckle could be thrown like Captain America's shield, specially designed to do so. After being exposed to radiation, Belinsky's form may have become entirely radioactive energy, though her new true form has not been seen, and her costume may act as body armor to contain her energy form. The true capabilities of her new powers are not known, though they don't seem to be as powerful as those of the Presence. She can form force fields and energy blasts from her powers, and can travel at warp speed, even through space. She can also absorb radiation. Belinsky can survive without food, water, air, or sleep. She is often under the mental subjection of the Presence. History: (Defenders I#55 (fb) - BTS) - A faithful member of the Soviet government, neuro-surgeon Tania Belinsky grew to love her country's way of life, though she had some reservations about it. She heard legends of the "man behind the man", Codename: Sergei, and embraced the legend of Soviet hero, Red Guardian. 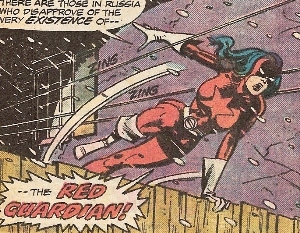 When the latest Red Guardian was believed killed, Tania adopted the identity for herself and fought for Soviet ideals. (Incredible Hulk II#259 (fb) ) - Red Guardian was sent to stop Professor Phobos, who had been draining the power of many Soviet heroes for years, but she failed. (Defenders I#35) - Red Guardian rescued a woman from a mugging by Pyotr, then rushed back to her apartment before the police arrived. She received a call from the United States, from Dr. Stephen Strange, who sought her services as a medical practitioner in doing a brain transplant on his ally Kyle Richmond (the hero, Nighthawk). She received the necessary clearance and left for the states immediately. She was accompanied by Mr. Kaslov, and they met Strange and statesman Taylor Charles at the airport. Prepping for the surgery, Tania confided in Dr. Strange that she'd like to extend her stay in the country, but that Russia suspected she'd attempt to defect. (Defenders I#36) - The operation a success, Tania greeted Richmond when he awoke. Some men burst in to accost Tania and she knocked them aside, hoping Richmond was too groggy to notice her skills. Strange informed Tania that he'd persuaded Kaslov to let her remain in the states for a time, a guest at his mansion. They read in the paper of the Celestial Mind Control Movement. Back at Strange's mansion, Tania met Wong and was shown around the mansion. Surprised when Strange rushed off, she followed his as Red Guardian. She attacked Plantman when he accosted Strange, and was taken aback by his turning the attack on her. They were both soon captured and held in a plant-formed cell with the kidnapped Richmond. Tania revealed her secret identity to Strange. (Defenders I#37) - Strange finally managed to help them escape from the prison, and they were attacked by carnivorous plants, though Strange's ally Power Man arrived to aid them, causing Plantman to flee. Red Guardian met Power Man and Jack Norriss. Back at the hospital, she expressed her disgust to Power Man that he charged for heroic services. She, Strange, Power Man, and Jack Norris were apprehended by villains Eel and Porcupine. (Defenders I#38) - Nebulon deposited the Defenders (sans Norriss) in a hostile dimension where Strange quickly learned he could not employ his magic without pain. They holed up in a cave until a creature attacked them. The allies fought the beast until Power Man vanquished it, then Red Guardian noticed she was covered in bugs that would start to eat her flesh. Nighthawk joined them from a doorway in the Celestial Mind Control Movement headquarters, giving the heroes an exit to home, where they battled the Movement's Bozos, Porcupine, and Eel. Red Guardian was fortunate as the journey had killed the bugs, but the beast followed them as well. They defeated the villains and Strange subdued the beast. (Defenders I#39) - While Dr. Strange did a mystic self-inventory, Red Guardian and the Defenders worked to find Valkyrie. Red Guardian was amused by the plethora of heroes in America and the frequent conflicts they found themselves in. Red Guardian and Power Man searched the streets, and she commented on the state they were in, asking questions about American culture. When a jealous man tried to stab Power Man, Red Guardian knocked him aside. Later, they retrieved Valkyrie from the jail she'd been incarcerated in. (Defenders I#40) - Red Guardian watched Valkyrie pardoned for her crimes, and commented on American culture, noting Nighthawk's willingness to dispense his riches freely. The Committee for Free Emigration threw a rock through the window aimed at Red Guardian, who rushed to pursue them herself. Red Guardian chased down the men who'd thrown the rock and disarmed them. She carried a wounded man up the stairs to a woman's apartment to call for help, but the woman, Mrs. Rosenzweig, pulled a gun and allowed the Committee's Assassin to enter. They planned to use Red Guardian's status with the Russian government against them, but Red Guardian fled, soon fighting the Assassin in the street. His cyborg hands hurt her, but she left him defeated and returned to the Defenders. (Defenders Annual#1) - The Defenders watched a video in which Jack Norris postulated that much of the Defenders recent incongruent actions were due to mind-tampering by the Headmen. The Defenders agreed to begin addressing the world challenges that they'd been subliminally avoiding. Nighthawk and Red Guardian were sent to Paris, France, to investigate the recent uprising of Bozos there. Red Guardian and Nighthawk rescued an advertising man from being killed by the Bozos, and captured one Bozo named Marie, who Red Guardian posed as. She infiltrated the headquarters and was shocked to see the alien Ludberdites working behind the Movement. She was interrogated by Nebulon via a conference call, and was then ordered to have mental reconditioning due to her strong will. Shrunken Bones from the Headmen shrank the entire headquarters with a blast from his shrinking gun. The Defenders were all gathered into one sphere and the Hulk freed them. Red Guardian and Nighthawk defeated Chondu while the other Headmen and Nebulon were also defeated. (Defenders I#41) - Red Guardian and her allies were called to the American southwest to aid Dr. Strange, Nighthawk, and Trish Starr against Shazanna the sorceress. (Incredible Hulk II#206-207) - Red Guardian joined her allies in opposing the Hulk, who was destroying the city in a grief-filled rage. Despite being buried in rubble, the Defenders managed to stall the Hulk, Red Guardian with using her belt buckle. Hulk was soon calmed down and returned to the mansion, though the news that his love was dead caused him more grief. (Defenders I#42 - BTS) - Red Guardian strangely disappeared, causing her teammates concern. (Defenders I#43) - After being briefly detained at the Soviet embassy, Red Guardian rushed to aid her teammates in battle against Cobalt Man. Clea attached Red Guardian's mind to Cobalt Man's, and Red Guardian learned of the villain's origins, helping him release his brainwashing. Egghead attacked the mansion, and Cobalt Man seemingly disintegrated with Egghead in his arms. (Marvel Comics Super Special#1) - Red Guardian was among the Defenders who met with Dizzy the Hun and decided to stay out of the newly-empowered KISS' conflict with Dr. Doom as well as their extradimensional travels. (Defenders I#44) - Red Guardian received a call from Russia stating that her loved ones may be harmed unless she returned to her country. She helped her teammates find Strange with her knowledge of mystic Omar Karindu, then departed to confront her superiors. Red Guardian confided in Valkyrie, and met Hellcat when she arrived with a dire warning of the mystic Star of Capistan's power. They noticed many citizens, including Wong, ensorcelled and walking the streets. They traced the source to Red Rajah, secretly Dr. Strange under the influence of the Star, who had Power Man, Hulk, and Nighthawk enslaved as well. (Defenders I#45) - Valkyrie, Red Guardian, and Hellcat fought a mountainous image of Dr. Strange that Red Rajah created, then fled, barely saving Red Guardian from being ensorcelled. The women discussed possible reasons why they may have been able to resist Rajah's teachings, Red Guardian assuming that her desire for unity over individualism is what caused her temporary temptation. Clea joined them and they returned to fight Rajah and his minions. Red Guardian successfully evaded Nighthawk's blows and caused him to hit the ground. Clea freed Strange, and the Defenders made amends, though Strange announced he was leaving the team. (Defenders I#46) - While the Defenders changed lineups, Red Guardian bid farewell, needing to tend to her personal concerns. (Defenders I#49) - Red Guardian returned to Russia and was greeted by the KGB, who revealed they knew of her heroic identity. (Defenders I#51) - She was taken to unfamiliar territory and informed that the man besides her extradition home was Codename: Sergei. (Defenders I#52) - Red Guardian was given a facsimile of her costume to wear, and briefly fought against her 'captors' before she had a control cowl placed on her head that calmed her mind along with a radiation robe. She was shown into the Presence, who announced that she was his perfect mate and that he would be subjecting her to radiation treatments so that the two of them could become higher beings together. Her mind calmed, Red Guardian agreed. (Defenders I#53) - Weeks passed, and Red Guardian grew to admire Presence, though her full will was still subjugated. He planned to subject her to a nuclear bomb. Unable to wake her faculties, Red Guardian and Presence felt the exploding bomb wash over them. (Defenders I#54) - Presence and Red Guardian clasped hands as they soaked in the radiation. They investigated a ship that had crashed in the blast and found Hellcat, Hulk, Nighthawk, and Sub-Mariner with a contingent of Atlantean military. (Defenders I#55) - Red Guardian, still under the control of the Presence, began using new powers, including flying and emitting deadly radiation blasts. The Defenders tried to attack them and Red Guardian fired blasts at Hellcat, though subconsciously disgusted by her actions. At Hellcat's proddings to remember who she was, Red Guardian finally embraced her true memories and began to break free from the influence of the Presence. Hellcat rescued Red Guardian from being crushed by the toppling Behemoth from Below, who'd attacked and been defeated by the Hulk. Finally in control of her faculties, Red Guardian stopped Presence from killing her friends by telling him she cared more for them than for him, causing him to depart in sadness. Her friends collapsed from radiation exposure. (Defenders I#56) - While her friends received medical treatment, Red Guardian was transported elsewhere and isolated. (Defenders I#59) - Soviet scientists, Fyodr and Vladimer, worked to stabilize Red Guardian's condition, but realized it was hopeless. They wondered how long she would participate with them as the extent of her new powers was unknown. (Defenders I#64 - BTS) - Tania was kept at a Soviet research institute observed by General Kharkov and several scientists. (Defenders I#65) - Reflecting on her life and the strange things that had happened to her, Red Guardian sat in isolation. She was called out by Gen. Kharkov, who informed her that Presence was in the Forbidden Zone and that he was releasing an amoebic radioactive creature on the country. They asked her to intercede on the behalf of all Soviets, and she agreed. Red Guardian traveled to the Zone, where she found the massive amoeba feeding off the Presence. Realizing Presence wasn't behind the attack, Red Guardian tried to release him but was pulled inside as well. Presence grabbed her hand and they linked, allowing them to escape. He confessed his love to her, and the two of them battled the amoeba rather unsuccessfully until joining forces and giving off the force of a nuclear explosion, destroying the amoeba. Perhaps recognizing her place now, Red Guardian decided to remain with Presence in the Forbidden Zone, christening it their new home. (Incredible Hulk II#250) - Red Guardian was seen near the Kremlin by the Soviet Super-Soldiers. (Incredible Hulk II#259 (fb) - BTS) - Presence and Red Guardian decided to fight against Professor Phobos. They began expanding the radioactive borders of the Forbidden Zone, using machinery to expand their influence, and causing the government to question their motives, sending some of their agents to investigate. (Incredible Hulk II#258) - Red Guardian and Presence worked in the Forbidden Zone to contain the radiation that Professor Phobos was spreading. When they were distracted by a battle between the Hulk and the Soviet Super-Soldiers, the pair fired twin blasts at the Hulk and Ursa Major, reverting them to their human forms. (Incredible Hulk II#259) - Presence and Red Guardian removed Hulk and Ursa Major's abilities to change into their monstrous forms. Presence read Ursa Major's mind and realized that Crimson Dynamo, Darkstar, and Vanguard were also nearby and sensed a fourth personage, who they later learned was the Professor Phobos. Presence and Red Guardian departed and focused their energies on their machines until Vanguard and Darkstar attacked them, holding them off with attacks and then in pitch blackness until they escaped. However, Professor Phobos turned the radiation machines on and held Presence and Red Guardian in stasis while draining their powers. Eventually Presence restored Hulk and Ursa Major's powers to them and Professor Phobos was defeated. Presence was shocked to learn that Vanguard and Darkstar were his children, whom he'd believed dead all those years, but he and Red Guardian had to absorb the excess radiation in the Forbidden Zone and departed for space to safely release the radiation, bidding his children farewell. During the battle, Red Guardian continually reminded Presence to not harm mortals. (Quasar#23 (fb) - BTS) - While traveling through space, Presence and Red Guardian were picked up by the cosmic Stranger and placed in an artificial radioactive eco-system, aboard the Stranger's world, to thrive so that the Stranger could observe them. They, however, did not know who their captor was. (Quasar#23 (fb)) - After months of looking for escape from their eco-system, Presence and Red Guardian were approached by another cosmic entity, Anomaly, who claimed to be a fellow captive. Anomaly told Presence that a malevolent being named Eon threatened Earth, and advised them to destroy Eon if they ever made it back to Earth. (Quasar#14) - The alien Over-Mind telepathically contacted dozens of captives on the Strangers' world, including Presence and Red Guardian, and freed them from their cells. Over-Mind was soon defeated. (Quasar#19) - Presence and Red Guardian aided Jack of Hearts in moving several of the former captives toward Earth. They spent weeks traveling through space in a type of caravan. When Earth hero Quasar came to investigate, he was defeated by Jack of Hearts, and Presence wanted Quasar killed. He planned to get to Earth as soon as possible to fight and battle Eon. (Quasar#20) - The Presence and Starlight broke Quasar's quantum sphere so that they could kill him, despite Jack of Hearts' protestations. The Presence blasted Quasar with a burst of energy that seemingly destroyed him, but Quasar actually quantum-jumped at the last moment. Thinking Quasar dead, Jack of Hearts turned on the Presence and Starlight, but a combined blast from the duo ruptured his containment suit. Realizing he was about to explode, Jack flew after them to destroy them, but his detonation only succeeded in hastening their journey Earth. The Presence and Starlight broke into Four Freedoms Plaza, injuring Kenjiro Tanaka as they burst into the offices of Vaughn Security Systems. The Presence assigned Starlight to stand guard while he set off into the Eonverse to slay Eon. The Fantastic Four confronted Starlight and managed to contain her within the Invisible Woman's forcefield. Starlight was taken into custody, while the Presence was lost in the Quantum Zone while battling Quasar. (Marvel Comics Presents I#70/4) - Presence was reunited with Belinsky in Khystym and he grew slightly mad with power. After hearing reports of Black Widow and Darkstar in the U.S. (both Soviet heroines), Presence sent Starlight to retrieve them, holding her under mental sway, desiring to take them to wife (apparently having forgotten that Darkstar was his daughter). Starlight traded blows with the heroines in Black Widow's apartment, struggling with Darkstar's Darkforce energy constructs, until she was encased in the Darkforce dimension, which freed her mind from Presence's control. She returned to him, determined to see his get better. (Quasar#60) - After Vanguard was killed in battle, Presence, Starlight, and Darkstar mourned him, and Presence learned that Quasar was ultimately responsible for the death. Furious, Presence and Darkstar departed to find Quasar, instructing Starlight to kill Quasar's family if they failed. (Avengers III#43 (fb)) - Presence and Starlight continued visiting Vanguard's memorial site at the Kremlin privately, Presence reflecting on how his powers were not enough to save his son. Determined to try something, he sent Starlight away and shrunk himself into a small particle energy form, entering Vanguard's body, and realized that there was still a semblance of energy there. By sacrificing his own vast stores of energy, Presence managed to restore Vanguard to life, though it took Presence months to restore himself to natural form. He developed a plan to restore the Soviet Union to glory by transforming citizens into radioactive beings that he could control. He returned to Khystym and informed Starlight of his plan. He blasted the surrounding area with a spreading radioactive contagion that would kill all and put the formerly living creatures in his control. (Avengers III#40 - BTS) - A group of SHIELD agents stationed in Slorenia, with Avengers Black Knight (Whitman) and Firebird moved to investigate the radiation surge. (Avengers III#41 - BTS) - Meanwhile, a team of Avengers (Captain America, Quicksilver, and Thor) joined the other two heroes in investigating. (Avengers III#42 - BTS) - Presence took control over the Winter Guard when they investigated. When the Avengers got near, Presence and his enslaved heroes moved to attack. (Avengers III#43) - Presence hung back while the Avengers and the irradiated heroes battled and the Avengers managed to get the upper hand by using anti-radiation foam. Presence, with Starlight, moved in and destroyed their defenses, unleashing a blast that killed the Avengers and made them Presence's servants, all except Thor and Firebird, who had natural immunities against Presence's powers. (Avengers III#44) - Thor and Firebird fought the irradiated heroes more until Presence turned his attack directly on Thor, who used his hammer to begin draining the Presence's energy. Presence soon found himself helpless as vast amounts of his life energy was being drained, and Starlight begged for his life, promising to restore all the irradiated heroes to their normal states. Thor agreed, and Starlight cradled Presence's fallen form before the two were arrested, unresisting. (Avengers III#52) - Presence and Starlight were released from custody to fight against Kang's forces in the Soviet Union. (Avengers III#53) - Presence and Starlight joined a contingent of Avengers in battling Kang in space. Presence planned on returning to Earth and renewing his plans, but Starlight talked him out of it. They fought their way into Kang's ship and watched it crash to the Earth, Kang finally defeated. (JLA/Avengers#4) - Gargoyle saved citizens alongside Defenders members Nighthawk, Starlight and Valkyrie from the disasters caused by the merging of the DC and Marvel Universe. (Darkstar and the Winter Guard#2 (fb)) � After the death of Darkstar, the Protectorate (Fantasma, Perun, Powersurge, Steel Guardian, Vanguard, Vostok) left the team in disgust. They traveled to Limbo, where Vanguard pleaded with Immortus to alter the time stream and allow Darkstar to live. Immortus told them of the Dire Wraiths that afflicted his realm and the group agreed to fight for Immortus for one year, during which Steel Guardian was killed and Vanguard and Starlight started a relationship. When Fantasma revealed herself as a Dire Wraith and escaped to Earth, the three surviving members of the Protectorate pursued her. (Darkstar and the Winter Guard#1) - Starlight, Vanguard, and Powersurge appeared back in their home country, careful to watch for their enemies, and proudly announced that the Protectorate had returned. (Darkstar and the Winter Guard#2) - Starlight, Vanguard, and Powersurge battled terrorists the Sword of Judgment in the streets of St. Petersburg, where they took down massive amounts of offensive weaponry as the media recorded them. Figuring this would draw Fantasma's attention, they were soon attacked by the Winter Guard (Crimson Dynamo, Darkstar, Red Guardian, Ursa Major), and Starlight was briefly injured by a redirected blast from Vanguard during the fight. She soon had the chance to explain what they were doing there, and they joined with the Winter Guard to fight the Dire Wraith takeover of the Citadel. (Darkstar and the Winter Guard#3) - Starlight and her allies were attacked by Fantasma's deadly Deathwings, which they held the way until Darkstar teleported them to the citadel. Working as a team, and using Starlight's medical prowess, they upgraded Powersurge to handle the Dire Wraiths. As the Wraith hatchlings attacked, they ripped Red Guardian's head from his body. In the battle to follow, they found Presence and Fantasma in the citadel, but Darkstar was soon killed. A furious Vanguard launched himself at the Presence, and Starlight narrowly saved Vanguard from Fantasma. Powersurge opened a gate to Limbo and Fantasma was thrown in, but she pulled Starlight with her as the gate closed. Comments: Created by Steve Gerber, Sal Buscema, and Klaus Janson. Thank you to Prime Eternal and Snood for their help with this profile. Thanks to David Gallaher (yep, the writer of Darkstar and the Winter Guard) for pointing out that:"It was actually Steel Guardian, not Sibercat, that was killed. Sibercat was not present -- and was not a member of the Protectorate." 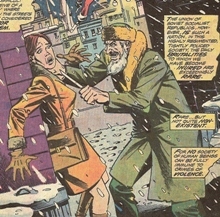 (Defenders I#35) - Pyotr, a native of communist Russia, broke the law and pulled a knife on a woman to get her money. The costumed woman, Red Guardian, stopped him, knocking him aside, though he chastised her actions. She soon had to flee before the police arrived. (Defenders I#35 (fb) - BTS) - Dr. Stephen Strange helped cut an ulcer out of Taylor Charles years ago. (Defenders I#35) - Charles used his office as a state representative to aid Strange in procuring Russian doctor Tania Belinsky to the states for a special operation on millionaire Kyle Richmond. (Defenders I#35) - Mr. Kaslov accompanied Russian doctor Tania Belinsky to the United States to attend to a special operation. They watched as she performed the operation. (Defenders I#36) - Dr. Strange used his powers to mesmerize Kaslov into letting Belinsky stay in the states for a time. (Defenders I#59) - Soviet scientists, Fyodr and Vladimer, worked to stabilize the radioactive conditioning of Red Guardian, who'd been subjected by Presence to a nuclear explosion, and realized that her condition was not stabilizing. They wondered how long she would participate in the studies as the extent of her new powers was unknown. 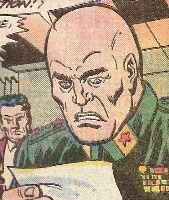 (Defenders I#64) - Kharkov continued reviewing Red Guardian’s progress, concerned about her deadly status. General Kharkov was informed that Codename: Sergei (the Presence) had been located inside the Forbidden Zone.